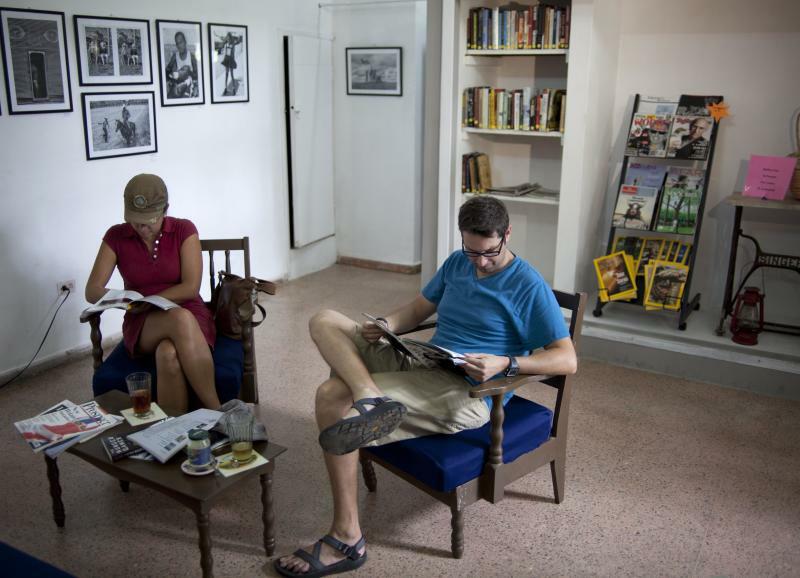 HAVANA (AP) — Cuba's first English-language bookstore offers a selection that would just about stock the lobby of an average Vermont bed and breakfast. Next to what's available in English elsewhere in Havana, it might as well be the Library of Congress. The brainchild of a longtime U.S. expat, Cuba Libro launched Friday as a bookshop, cafe and literary salon that offers islanders and tourists alike a unique space to buy or borrow tomes in the language of Shakespeare. Cuba Libro also gives customers an occasional glimpse of opinions hard to find elsewhere on the island. "I know how hard it is to get English-language sources here," said New York City native Conner Gorry, 43, a journalist living in Cuba since 2002. "So I started cooking this idea." Cuba Libro is a play on "libro," the Spanish word for "book," and "Cuba libre," the rum-cola cocktail that, legend has it, was invented in 1900 to celebrate the island's independence from Spain. The concept was hatched two years ago when a friend told Gorry that she had a sack of about 35 books she didn't know what do with. More donations swelled the collection to the 300 or so volumes on sale at opening day. Locally produced English-language fare in government stores includes the occasional translated Cuban novel, two weekly newspapers full of the bland official-speak of state media and a smattering of tourist magazines. Beyond that, it's mostly works like the translated writings of Fidel Castro and Ernesto "Che" Guevara, and pro-government literature denouncing the United States. One state bookshop offered a few dog-eared texts pushing the definition of random: "Diving Physiology in Plain English," a volume published by the Undersea Hyperbaric Medical Society, and "Woe Unto You, Lawyers!" a first-edition critique of the legal profession from 1939 that, judging by a sticker inside, once belonged to the Columbia University Law Library. Gorry said Cuba Libro is not in the business of offering anything that could be considered "counterrevolutionary." But the collection does include views not commonly found on an island where the government controls nearly all media. For starters, there's Mexican journalist Alma Guillermoprieto's "Dancing With Cuba," a nuanced memoir of her experiences in Cuba, warts and all, as a ballet instructor in the 1970s. Along with back issues of the New Yorker and Rolling Stone, there's a summer 2010 edition of ReVista, the Harvard Review of Latin America, dedicated to Cuban ally Venezuela. It's generally sympathetic to the late President Hugo Chavez but also includes an essay by critic Teodoro Petkoff calling Chavez's government "an authoritarian, autocratic and militaristic regime." You'll never hear that on Cuba's nightly state TV news broadcast. "I hope (the store) flourishes," said Carlos Menendez, a 77-year-old retired economist who dropped in for a coffee and was delighted to find "Freefall" by Joseph E. Stiglitz, 2001 winner of the Nobel Prize in Economics. "Freefall" argues for more government regulation of the U.S. economy, but even a left-leaning prescription for capitalism is a novelty in this Communist-run country where the concept of the free market is anathema. "It is increasing in Cuba, the possibility to have different alternatives," Menendez said, seated in Cuba Libro's shady patio under a towering almond tree. He was referring to President Raul Castro's economic and social reforms, which have allowed hundreds of thousands of islanders to legally open or go to work for private small businesses in recent years. 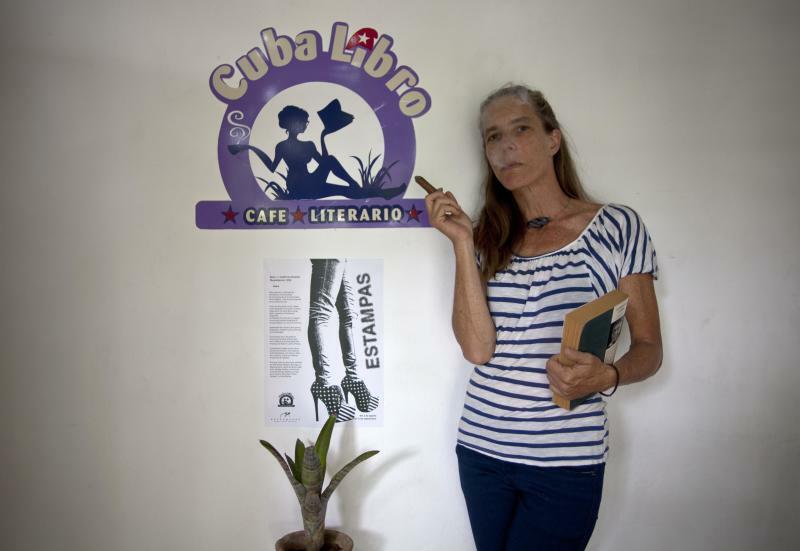 Cuba Libro operates on food-service and used-book-sales licenses made possible by the reforms and is run with Gorry's help as a kind of unofficial cooperative, or group-owned private enterprise, by five Cubans. Washington's economic embargo bars U.S. citizens from financial transactions with the Cuban government, and Gorry said she has taken pains not to run afoul of laws back home. "I've had to tread extremely carefully, everything above-board and legal, because I'm an American, I'm a North American, I am beholden to U.S. laws," she said. "And so I'm not in agreement with those laws, but I abide by them." Cubans tend to be well-educated, with millions attending Havana's annual Book Festival each February to snap up Spanish-language volumes for just pennies. At the same time people are increasingly eager to learn English for careers such as computing or medicine, or as a ticket to a relatively high-paying job in the tourism industry. Cuba Libro is already planning English classes taught by native speakers. And those who can't afford to buy books will be able to borrow in a lending-library format. Meanwhile staffers are reaching out to diplomats and other foreigners to build the store's stock. "Getting donations is going to be another interesting piece of it, because importing books here is very difficult," Gorry said. Her litmus test is that books be good literature, and she's trying to keep dime-store mysteries to a minimum. Still, there's a small whodunit section with the likes of Sue Grafton's "Q is for Quarry."